This is Brighid's Well - also known as The Well of Eternal Youth on the Isle of Iona. This quiet pool nestles among ancient rocks on the highest point of the island - Dun I. 'Dun' is Gaelic for hill and the word 'I' is the name by which some believe that Iona was once known. This is the Hill of Iona - and indeed, it is the highest point on the island. The islands of the Hebrides themselves are named after Brighid - Hy Bride - the Islands of Brighid. Legends of the Western Isles of Scotland tell how young Brighid was visited on this Iona hill top by shining beings of light. They flew away with her to the town of Bethlehem, where she tended to Mary in her hour of need, as she gave birth to the Christ, Jesus. To this day, Brighid is still sometimes known as 'The Foster Mother of Christ'. She has many names. She is sometimes called 'The Fiery Arrow' - the lightning streak that comes from the dark, to call us to our destiny. Others know her as 'Seek Beyond', a hand of light that beckons us towards the distant horizon, where we step out of our familiar, comfortable world to find new, more authentic ways of being. She is 'Brighid of the Harp', known as the well of inspiration for poets, artists and musicians. She is healer, midwife and smith - mistress of the alchemical arts. She take us towards transformation, and aids us as we birth our tender new being into the world. Other legends say that she visits the Well at midnight on the Summer Solstice, and blesses the waters of the pool. Many pilgrims have carried the healing waters away from the island, hoping to be touched by the soul light and wisdom of Brighid. 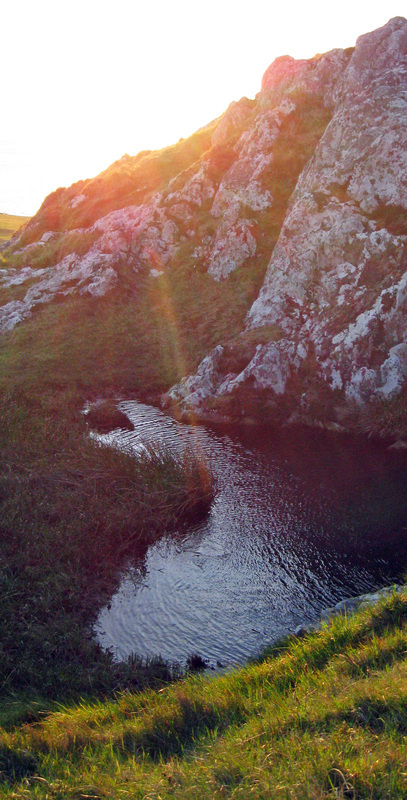 Brighid's Well, on The Isle of Iona, lit by rainbow rays of dawn light. This is the first of the Celtic spring festivals, which also corresponds with Candlemas, on 2nd February, in the church calendar. 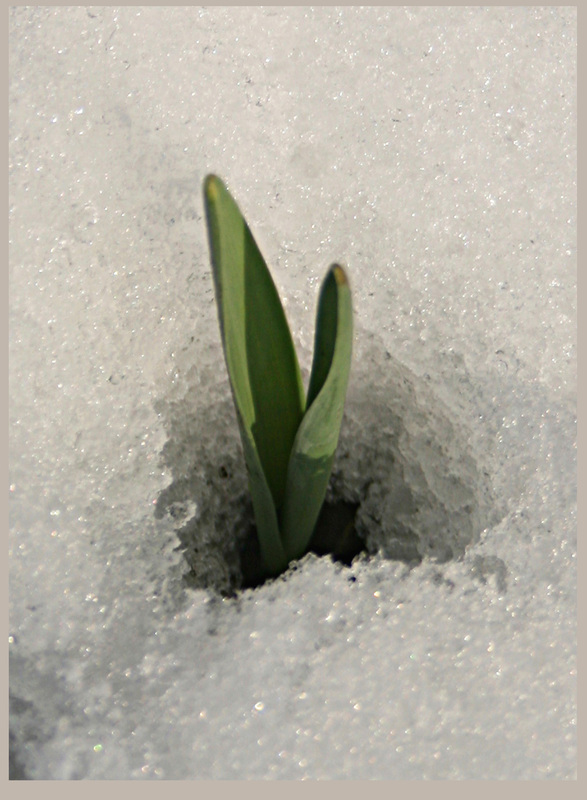 Imbolc falls on the first day of February. Imbolc is dedicated to Brighid. Legends tell how she walks the land during the night before Imbolc dawn, carrying her light of hope, healing and inspiration to all those in need. 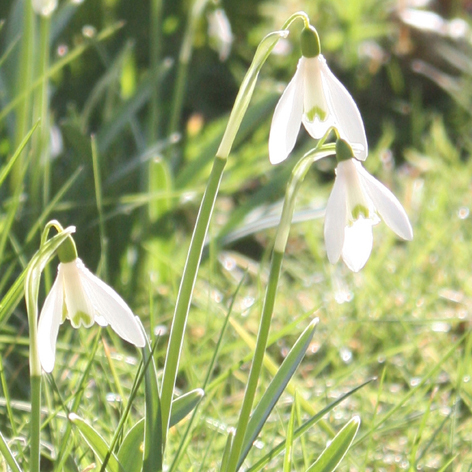 Snowdrops are often seen as a symbol of this festival - delicate pure white flowers, pushing inexorably through snow and ice to reach the light of the sun. This symbol can be a powerful image with which to work, on our own spiritual journey. As we struggle to birth the true, authentic self that is at the core of our being, Brighid acts as our midwife. She brings comfort and strength, inspiration and courage. She is associated with poets, healers and smithcraft.